Detroit, MI – The Motor City is in the middle of an historic paradox. Detroit has struggled with the largest municipal bankruptcy in the nation’s history. But Detroit’s downtown is enjoying rapid growth. The busy, 7.2 square mile heart of the city is seeing drastic drops in vacancy rates, and high-profile businesses are moving in. Even as bankruptcy rocked Detroit’s headlines, business expansion continued to rocket across its downtown skyline. When bankruptcy rumors surfaced, advertising and marketing firm Campbell-Ewald announced plans to move 600 employees to a downtown office. “The demand for space keeps going up up up,” said John DeGroot, vice president of research for Newmark Grubb Knight Frank, which tracks office vacancy rates nationwide. Many businesses are drawn to Detroit’s attractive rental rates. Downtown rents can be 7% to 25% lower than rates in nearby suburbs, so growing companies are deciding to set up shop downtown. And all types of business are quickly taking over the Motor City. Quicken Loans, Michigan Blue Cross/Blue Shield and DTE Energy have all relocated from the suburbs to downtown. 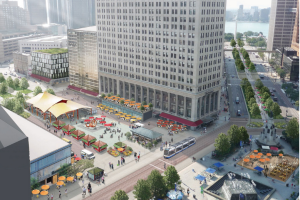 “One reason we believe this [revival] will have legs is it goes across multiple industries,” said Cindy Pasky, president of the firm Strategic Staffing Solutions and the chairman of the Downtown Detroit Partnership. Detroit native Dan Gilbert, the founder and chairman of Quicken Loans, dominates the city’s real estate surge. He has spent approximately $1.2 billion purchasing and renovating 35 downtown properties in just over the past two years. Much of the space is being used by his family of 57 companies. Gilbert expects to break ground on a new office building next year. Retail stores and restaurants are no exception to the great business migration into the heart of Detroit. Olga’s Kitchen, Buffalo Wild Wings, Texas de Brazil Steakhouse and Salsarita’s are now occupying prime real estate locations along Detroit’s central Woodward Avenue.